From BizTalk360 version 8.1 onwards, if you are installing BizTalk360 on Microsoft BizTalk Server 2010 or 2009, we recommend you to install BizTalk360 in a separate machine (not on the BizTalk Server 2010 or 2009 machine). Minimum .Net version 4.5 is recommended for BizTalk360 version 8.1 and above for smooth functioning of Azure services. The following table shows the hardware requirements that need to be available to install BizTalk360. Computer and Processor A computer with an Intel Pentium-compatible CPU that is 1 GHz or higher for single processors.900 MHz or higher for double processors. 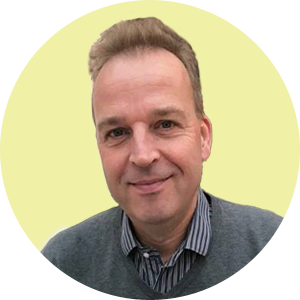 700 MHz or higher for quad processors The 64-bit versions of BizTalk Server require a 64-bit operating system running on an x64 based system. Computers based on CPUs that are compatible with the AMD64 (x86-64) and Extended Memory 64-bit Technology (EM64T) processor architecture are considered x64 based system.Hyper-Threading and Dual-Core processors are supported. Hard Disk (Database) 20 GB of available hard disk space for a complete installation including the operating system and all prerequisite software. The hard disk must be NTFS formatted. The following table lists the software required for installing and running BizTalk360. Microsoft .NET Framework Minimum requirement of Microsoft .Net Framework 4.0 Minimum .Net version 4.5 is recommended for BizTalk360 version 8.1 and above for smooth functioning of Azure services. Microsoft SQL Servers Microsoft SQL Server 2008 onwards (Express Edition is also supported). The BizTalk360 MSI Installer is automated to the extent of being able to detect the prerequisite connections. It will not allow you to continue further if any missing components are detected. If any errors are highlighted, you need to stop the installation process, correct the highlighted error, and then rerun the installer. Note: You also need to make sure you make these settings across the multiple environments where you install BizTalk360. 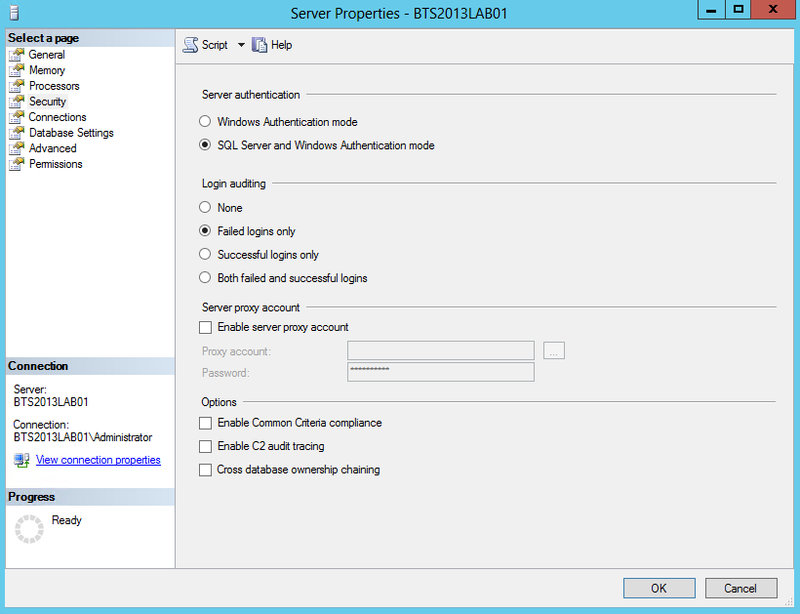 You also need to provide SQL Server SYSADMIN access to the service account. Read this to know more about the necessity to give SYSADMIN access. Important: Please make sure that you login to BizTalk360 server with the service account and proceed with the new installation or upgrade. This is to ensure that all permissions are in place and that you are able to login to BizTalk360 without any issues. In the Object Explorer panel, connect to SQL Server Instance and expand the tree view on the left side. Expand the SQL Server and 'Databases' and click 'BizTalkMgmtDb' database. Right click on BizTalkMgmtDb database and select the 'New Query' option. The SQL Server database engine has two types of authentication modes — Windows authentication mode and SQL Server and Windows Authentication mode (mixed mode). 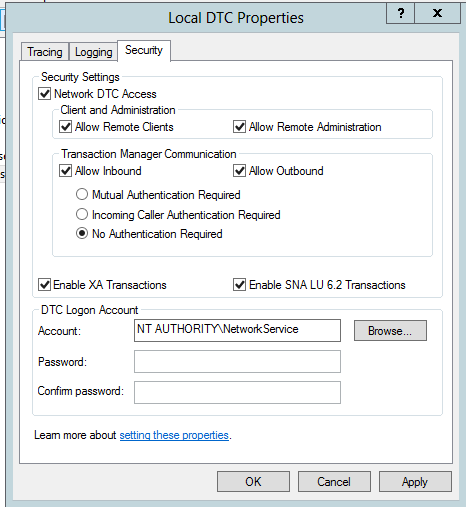 BizTalk360 supports both SQL authentication modes to connect to the SQL Server, however BizTalk360, by default, uses SQL server and Windows authentication mode (mixed) mode. Make sure either both Windows and SQL authentication is enabled on the SQL instance, where BizTalk360 database is hosted, or Change the config files (web.config and monitoring service.config) to use Windows Authentication. In Object Explorer, right-click your server, and then click Restart. If SQL Server Agent is running, it must also be restarted, Post BizTalk360 installation, a user profile has to be created for the Service account with Super User access privileges. Only then, BizTalk360 can perform operation automation capabilities (such as Resume/Suspend/Terminate) in Message Box data monitor. We recommend you start off by provisioning 10 GB for this purpose. The reason for this is that there are 2 features in BizTalk360 - Advanced Event Viewer and Throttling Analyzer that will cause the database to grow in size since they collect the data and persist the information. If the purge policy in BizTalk360 is set to the default values and you do not have too many hosts and host instances, then database size of 10 GB should be sufficient. If you are installing BizTalk360 on a standalone server, we recommend you to have memory of 8 GB or higher to serve the purpose. In order to deploy BizTalk360 on HTTPS, your IIS must be enabled for HTTPS/SSL. The below links explain how to setup SSL on IIS 6/7. Please consult your IIS administrator before changing anything in your IIS as it may affect other critical sites running on that IIS. The above steps will disable HTTP and enable HTTPS for BizTalk360. Depending on you IIS version and setup, you may need to reset IIS or recycle AppPool. Please consult your IIS administrator for more information. Basically you need to have SQL, WMI, DTC, IIS destination services configured. Configuring MSDTC is key in multi server BizTalk server environment configuration. Typically the following procedure should be followed in all BizTalk servers in a multi server environment. 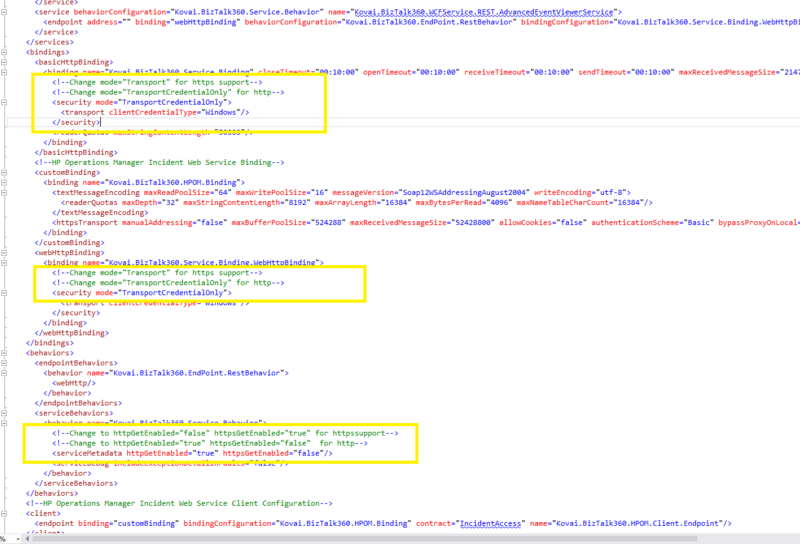 When you are installing BizTalk360 on a stand-alone (separate) server, you need to follow the exact procedures, since the underlying admin API's will rely on MSDTC. 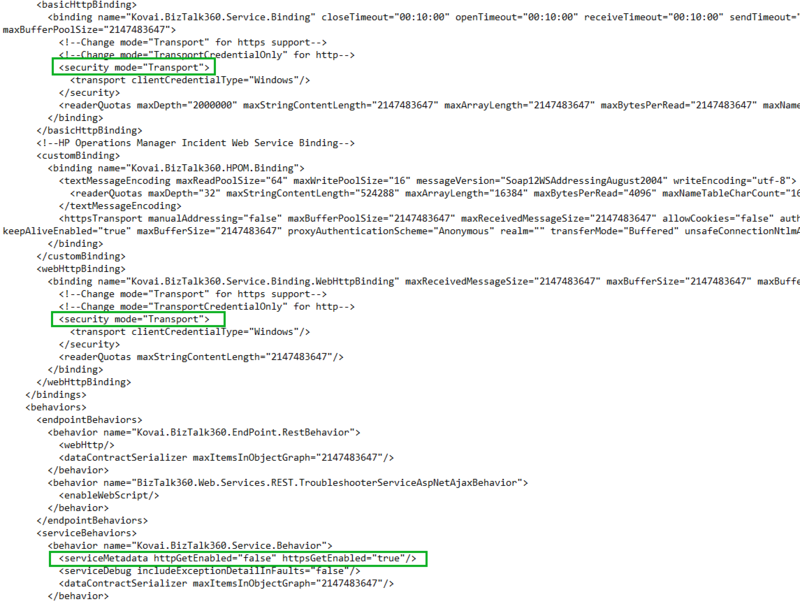 If you experience any MSDTC issues, you can use DTCPing.exe to validate the connection between the BizTalk360 server and server in the remote BizTalk environment. To obtain the DTCPing.exe tool, see http://go.microsoft.com/fwlink/?LinkId=72166. We have tested BizTalk360 against the following browser versions. We also support other browser versions on the best effort. The service account will have powerful access, but all other users who access BizTalk360 will have very limited access, they don't even need to belong to any BizTalk groups, BizTalk360 abstracts all the security requirements. BizTalk360 installation will not be proceeded using the service account user privileges.Service account should have local (Windows) admin privileges in the all the servers (BizTalk Server, SQL Server). To solve this, the user must be provided "db_owner" permission or SYSADMIN access in the BizTalk360 Database security. When the BizTalk360 service account (domain user account) which doesn’t have Sysadmin privileges on the BizTalk Database (BizTalkMgmtDb), you might face the below exception during the activation of license. BizTalk360 makes a direct query to some of the BizTalk databases for performance reasons. For that, you need to provide SELECT/EXECUTE permission for the BizTalk360 service account. When you attempt to enable/disable a receive location that uses the WCF-SQL adapter, or when you attempt to start/stop a send port, you may experience this error "Failed to create 'WCF-SQL' Transport Component". Once after installing BizTalk360, install the BizTalk Server Enterprise Adapter Pack in the server where BizTalk360 is installed. If you are using any 3rd party adapters like 'nSoftware', you have to install the nSoftware Adapter Pack as well on the server where BizTalk360 is installed. Some of our customers hesitate to provide the higher level permissions like Local Admin and System Admin due to security reasons. So we recommend to create a separate account for the BizTalk360 service and provide all the necessary permissions to isolate the credentials.